For those who know me that might come as a shock. I’m a big Apple fan, I have a Mac since 2007 and never thought of going back to Linux or Windows (until recently with Lion’s release, but those are another 2 cents). I got an iPhone 3G when they were released in Portugal. The first year using it was awesome, the second was normal, after that Apple turned my phone into a zombie. The last iOS 4 update, 4.2, left my phone crippled, unusable, with most of the new features left out. Still I used it for what I could… email, Twitter, music and a few apps. Everything else was a bloated and dreadful experience, even the mere act of typing something in the keyboard was a torture, it literally froze the keys for a few seconds. My 3G became a pale shadow of the awesome phone it once was. I needed a new device, it didn’t have to be a phone, I could perfectly live my daily digital life with a tablet, email, Facebook, Twitter, a good browser, WordPress support and I was set… but there was a problem: I was sick of iOS. For me, as an iOS user, I got almost no new features for my 3G with iOS 4. So sticking with the same OS for 3 years in a row, can get you pretty tired of it. I’m up to date on iOS info and rumors. I know what’s new for iOS 5 and I’ve played with a few iPhones 4… and even with all the new bells n’ whistles, I wasn’t buying it. Plus, with a new iPhone 4S or 5 or whatever Apple is going to release in October, it was more of the same. While looking for alternatives in the tablet world, I came across the Asus EEE Transformer, not the prettiest of the tablets around, but it’s a behemoth with excellent specs. 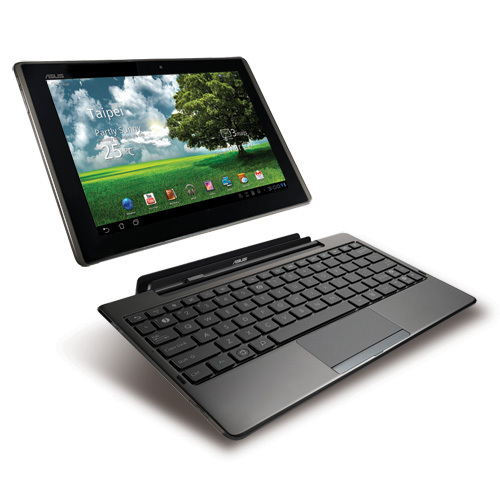 It runs Android Honeycomb, specific for tablets, it has a nvidia chipset and the bonus is the keyboard docking you can get, making it an excellent replacement for a netbook or even a notebook. The docking gives an extra battery juice, increasing the autonomy, the screen is up par with iPad’s, included are mini HDMI port, micro SD and full SD ports, USB… heck, a geeks dream! I played with it for a bit at a Worten store and I was very very surprised to see how much Android had matured since I last tested it. The experience was no less enjoyable that it was on the iPad 2, it was cheaper, more expandable and with a more open and customizable OS. 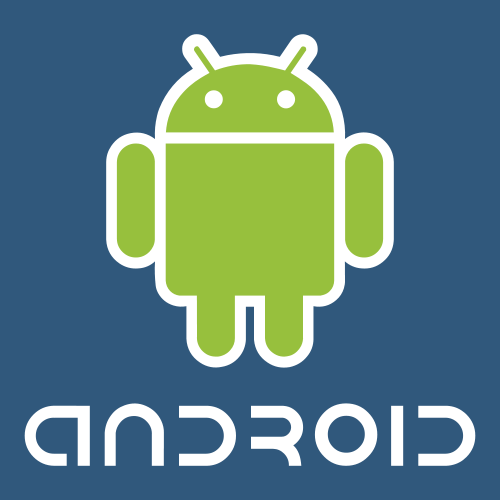 I began to update on Android info, how it was now, the releases, the apps, the devices running it, and yet again, I was very surprised. Android grew up to a very powerful OS and I didn’t notice, I was so closed in my Apple world that I forgot to look outside. When the day came, I was split between an iPad 2 Wifi + 3G and an Android phone. I know, twist on the plot, but the fact that the Asus Transformer doesn’t have 3G was a bit of a let down. That, and the lack of apps for tablets running Honeycomb on the Android Market. So, who was the contender? 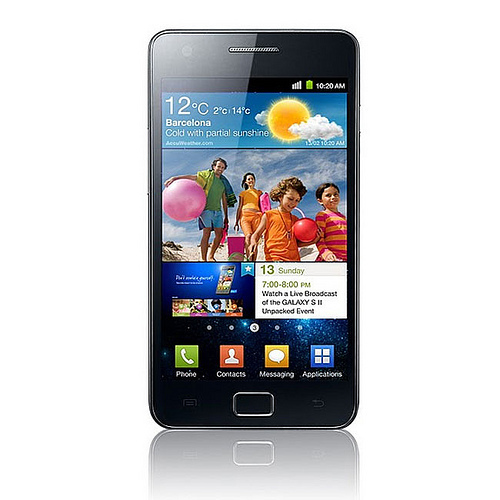 Samsung’s Galaxy S 2, the flagship of the Android phones! My friends with iOS devices kept telling me that the Android experience was bloated, the responsiveness of the devices were as good as in the iPhone. Crap, pure and utterly crap. The SGS2 it’s very very smooth and responsive, the Super AMOLED Plus screen is freaking amazing, the phone is light and slim, Samsung really tweaked it with their own apps, skins and interface. I decided to go for the SGS2, I’m using it since last Sunday and I’m not a bit disappointed. Google support and integration with the OS is amazing (naturally), it’s extremely customizable, the user interface is very intuitive, even with all the differences from the iOS, I managed to find my way through. 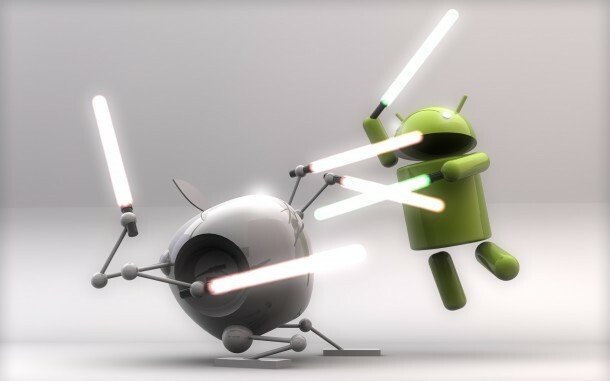 One common mistake is that people think about Android as a iOS clone. It’s not, especially in the user interface and usability. Spend a week with an Android terminal and you’ll see how fast you can make certain tasks that usually take more time to do with iOS. Apps really integrate with the OS. I can now share a photo, a music or an app using Bluetooth, Wi-Fi, post it to Twitter, Facebook, send it by email, you name it, all in one step, right there on the sharing menu. After installing Skype, when I go to my Address Book and pick a contact to call, the OS asks me if I want to make a regular call with the phone or with Skype. Less limitations, fewer restrictions. I know it’s a less secure OS, specially if you install apps from untrusted manufacturers, but that’s the users choice and responsibility. Apple “just works” OS comes with a price tag and you just find out how expensive it is after using Android. I could rant all day about the differences, but I dare you to find them for yourself. Still, Android might not be an OS for you if the closeness of iOS makes you comfortable. I might write another post, detailing more my experience with Android in a few weeks, but for now, I’m still discovering the ins and outs of the OS. So far it has been a great trip, and even with new SGS2 4G terminals announced I’m not even a bit miffed about it. It’s nice to see someone sum up how iOS and Android are clearly different and ons not necessarily better than the other. The funny thing is that everything you say about your iOS experience on an iOS device I can say for my Android experience on a 2 year old Android device. It’s all a matter of how much you can spend on the device and how long you expect it to last and for modern smartphones that lifetime seems to be getting shorter by the month. I have a iPhone 3G, but i will wait for iPhone 4S/5 appearance to make my decision. I had tried a Galaxy S 2 from a friend and i don’t like the lack of consistence in all the UI. Also the device is bad built and seems ultra fragile. @Gonçalo Rodrigues: The lack of consistency of your friends SGS2 might be caused by his customization. I don’t feel that in mine. I often made a comparison among my friends between smartphones and cars. iOS / Android and Porshe 911 Turbo / Nissan GT-R.
Gostei do facto de, apesar de seres o fã confesso da Apple, teres decidido experimentar algo diferente e mesmo assim conseguires manter a objectividade. A Android não é perfeito, mas é um sistema que está a evoluir com uma velocidade alucinante. Não é igual ao iOS, mas também não pretende ser. São filosofias diferentes que agradarão a alguns utilizadores mas que serão detestadas por outros. Penso que também é errado assumir que se detesta android por uma experiência menos positiva com um sistema mais barato onde se espera que este tenha o mesmo desempenho de um equipamento mais caro… A heterogeneidade do eco sistema android é uma das coisas que acho mais interessantes, onde a experiência que se tem com um equipamento é totalmente diferente da experiência que se tem com outro… Esta é a principal diferença para com o iOS e o motivo pelo qual prefiro o android. since when is iOS safer than Android?! come on, you’ll install whatever apps you want! you’re responsible for what you run on your computer/phone/whatever. and don’t forget that when installing an app on an Android system, it will _ALWAYS_ tell you the permissions it needs to run (i.e., manage contacts, use sms, etc.). anyway, you should try an HTC Android phone, like the Incredible S or Sensation. HTC Sense UI is the _BEST_ UI experience I’ve ever had..
oh, and btw I’m a proud owner of the Asus Transformer. beats an iPad 2 from any perspective. @Paulo Pires: The apps in the Apple App store are submitted to approval by Apple. Apple tests and only releases the app if it complies with their guidelines, one of them is security. Still, you’re right when you mention the security permissions shown in the Android Market. You can control the app right there. Don’t be too proud of this technological terror you’ve bought. The ability to integrate apps with the OS is insignificant next to the power of the iTunes Store. Antes de mais parabéns pela aquisição. Acho que ainda é muito cedo para “deitar foguetes”. Apesar de ser utilizador de alguns productos Apple (Macbook,Powermac,Ipod, entre outros periféricos mas não me considero fanático) e até simpatizar com Android (já tive um) acho que neste momento por mais “para trás” que o Iphone 4 esteja, este continua a ser “o smartphone” de eleição quando se está para gastar bons trocos. Acho que infelizmente os android mais caros não oferecem uma experiência muito diferente de um android low cost bem tweakado (Tive um LG P500 que com a Rom E Kernerl optimizadíssimo dos portugueses noein e franciscofranco deixava os utilizadores de galaxys S e desires (De origem claro!) a pensar duas vezes..
Esse a meu ver é uma das grandes maleitass do android, a falta da optimização de roms stock em devices tão caros.É que comprar um telemóvel de 500eur e ainda ter de ter trabalho a flashar roms acho que não é para mim. Isto e claro a mania de não haver telefones com hardware “topo” e com tamanhos decentes (vem ai o SE RAY salvar a coisa), é tudo com mil e uma polegadas). Como tudo na vida, o belo LG “low cost” P500 (170eur vodafone) com as usas belissimas roms tugas (E que foram extremo sucesso no xda) também tinha as suas desvantagens (as primeiras roms tinha problemas de lags que só uns 6meses depois se conseguiram corrigir (pela comunidade xda claro), e nem sempre as roms saiam perfeitinhas (muito beta testing fiz eu na cm7 em que metade não funcionava). Cada utilizador deve escolher o telemóvel de acordo com as suas necessidades. Posteriormente temos a questão do sistema operativo, hardware e finalmente o software. Vou manter-me utilizador de iOS, mas vejo com muito bons olhos a evolução do Android. Afinal de contas, o grande beneficiado pela concorrência é o utilizador final. Congrats… the stupid argument so far.